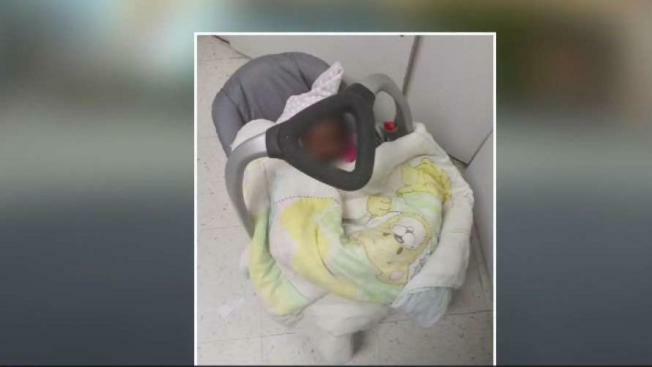 The child's parents are accused of abandoning their 6-week-old baby on a city sidewalk during an argument. Hartford police say a 6-week-old baby was left on a sidewalk, but a Good Samaritan acted to keep that child safe. "[The mom] was like, 'Just take my daughter and I'll find you,'" said Ebony Williams. That's how Williams said she found herself watching over a baby girl, wondering if and when her parents would return. Hartford police charged 22-year-old Kenya Anderson and 55-year-old Eddie Stevens with breach of peace, risk of injury, reckless endangerment, and child abandonment. Investigators say the parents got into a fight Friday evening on Maple Avenue near Super Clean Laundromat, which is where Williams was working. "What made me really intervene was when they were pulling on the carrier. One is snatching it one way, one is snatching it the other way. You can see an extremely tiny baby in there, so I'm thinking the baby is going to fall out," said Williams. She says she brought pepper spray as a precaution and tried to calm everyone down while working to get the baby out of harm's way. She says Stevens eventually put the car seat down and ran off, with the baby's mom chasing after him. At the time, police say it was 34 degrees outside. "It's a good thing I was already there," said Williams. Williams brought the baby into the laundromat and waited. She said Anderson returned about 30 minutes later and appeared extremely distraught. A police report reveals that the mom told Williams "to keep ownership of the baby because she did not want to catch another case with .... DCF." Officers reported that Anderson admitted to being intoxicated and that it appeared Stevens was as well. The police report also states “When asked why did [Anderson] leave the baby alone and unattended … Kenya Anderson stated she did not. Kenya Anderson stated she left the baby with Ebony Williams.” Anderson and Kenya did not know each other prior to the incident. Despite the chaos of the night, Williams says she's not going to judge anyone. She says she's just glad the baby is safe. "I hope that baby gets all the love that it deserves. I hope the mother gets the help that she needs," said Williams. "I hope both of them end up in a win-win situation." Police say the baby did not appear to be harmed and that DCF took custody. Williams says she just did what anyone would do. She says she tells her own sons that it's important to act because you never regret helping someone.